Marco Rubio is still talking smart on immigration reform and yet still supporting the Senate’s “comprehensive” immigration reform bill. I honestly wonder if he knows how badly he was rolled by Senate Democrats. I saw Rubio speak on Tuesday at the National Press Club in DC, where I attended as a representative of the blog culture, to borrow a phrase from Hunter Thompson. The actual subject was “retirement security” but the National Press Club being what it is—a club for the national press—they gave him the opportunity to alienate his base again. But he navigated those dangerous shoals as well as could be expected. The last was in response to an attempt to get him to either alienate the tea party or tie the tea party around his neck, and it was a good response. But if Rubio actually believed what he said about the opposition’s legitimate concerns, he should break his comprehensive bill into multiple focused bills: pass enforcement to show that this time, congress is taking enforcement seriously, and then once enforcement has been proven, pass non-amnesty, or whatever you want to call it. The last part is critical. The system we have now harms people who follow the law and encourages people to break the law. It is the opposite of a good immigration system. We want to attract the law-abiding and discourage criminals. We should not have laws we are not willing to enforce. But, as I said, Rubio didn’t come here to talk about immigration1 , he came to talk about saving Medicare and Social Security. If there is any indication that Marco Rubio is not going to run for President—or another term in Florida, for that matter—it’s that he has apparently chosen Social Security and Medicare as top legislative priorities. Rubio’s first reform is to shore up individual retirement savings by opening up the federal Thrift Savings Plan to the general public. Making it easier to save for retirement outside of company-sponsored plans is a great idea; making it a federally-managed plan is not particularly well thought-out. Part of the reason people don’t save is because it’s difficult: the tax laws are complex both at the time of saving and at withdrawal time. The correct solution is to simplify private savings. At the luncheon, each table had a couple of question cards that we could write questions on and pass them up to the head table2 . I saw my question get passed up until it reached a press table—who refused to pass it further, and so it was passed back around to me. You may see me in some videos of the event; I’m the guy walking up the center, turning right, and then handing a card directly to the head table. How will you keep Congress from “borrowing” from the TSP? I expect it was the use of “scare” quotes that put the question at the bottom of the pile. Perhaps I should have asked whether the TSP would be open to undocumented immigrants. 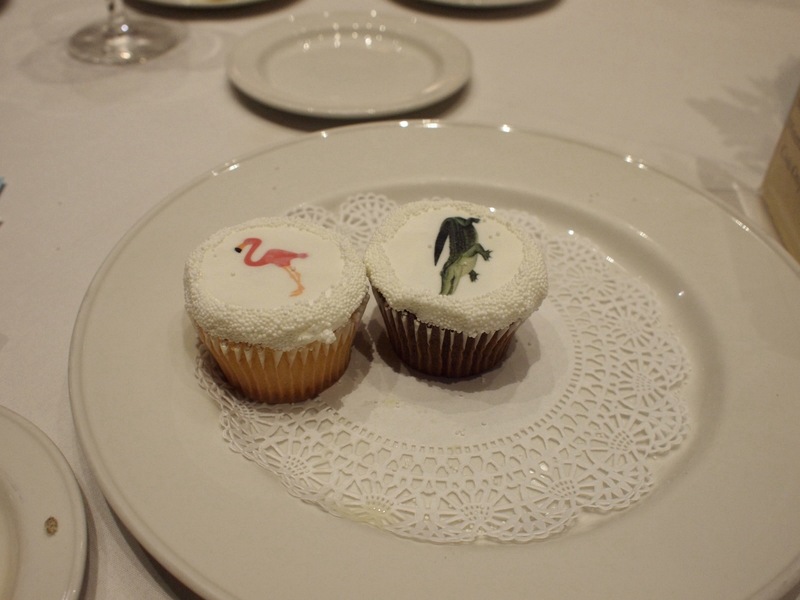 What Florida means to the beltway: flamingos and alligators. Politically, they may be right. He wants to open up Medicare to the savings of competition. He finds Medicare Advantage, Medicare Part D, and Paul Ryan praiseworthy. His Medicare vouchers most likely will support true competition, as, he said, seniors will be allowed to keep the savings if their plan costs less than the voucher. That’s good. As he said at the talk, competition means a “decrease in prices and an increase in choices”, which he said is already occurring under Medicare Advantage. In general, Rubio’s ideas were in the right direction. What I’d worry about is that he still trusts government too much. Just as he trusts the federal government to delay his non-amnesty until enforcement has been “certified”, he trusts the federal government not to abuse a big new pile of retirement savings. But history tells us this trust is sorely misplaced. Reforms should move toward giving people more control of their retirement, and should not move toward giving the federal government more piles of money to shift around. Immigration, I suspect, is very important to the National Press Club. I noticed that their service staff speaks to each other in Spanish. The National Press Club also appears to be going through a budget crunch. I turned my coffee cup over shortly after lunch began, as I don’t drink coffee. About halfway through the speech, one of the waiters took it (which I expected, of course) and brought it to someone at one of the press tables. I still haven’t decided if that meant disdain for us non-press or disdain for the press. The Thrift Savings Plan (TSP) is a defined contribution plan for United States civil service employees and retirees as well as for members of the uniformed services. As of June 2013, there were 4,614,874 participants, and over $358 billion in assets under management. 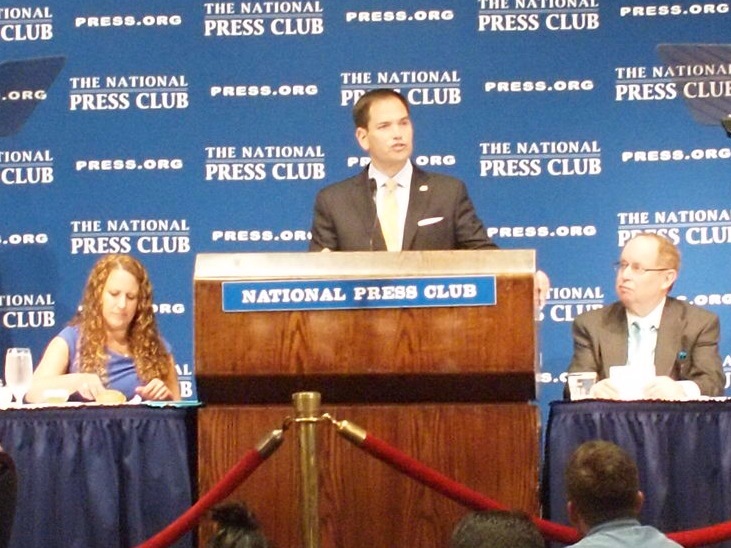 Senator Marco Rubio and the National Press Club last modified May 15th, 2014.